Rich Pickins Slots | 95.25% RTP, Bonuses and more! Grab your farming hat and get hands-deep in this year’s harvest! Rich Pickins Slots is packed with bonuses, multipliers up to 200x and more! Good luck! It’s time for the harvest at Vegas Spins! 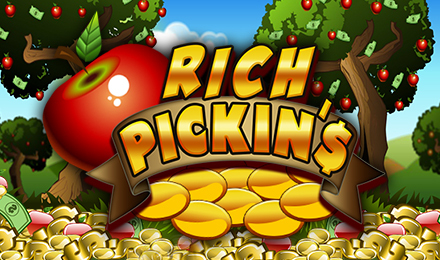 Login today and play Rich Pickins Slots! The reels are packed with delicious glimmering fruit – spin the Golden Apple on reels 1 and 5, and your bonus will begin! There’s a 95.25% RTP, and your Market Bonus will be triggered when 3 Fruit Baskets show up on reels 3, 4 and 5. Plus, the Farmer is Rich Pickins Slots’ Wild and can replace other symbols to complete winning combinations.